"The Five Americans, five Oklahoma kids who blew the roof off the national charts when they moved to Dallas in 1966 and cut smashes like 'I See the Light' and 'Western Union,' recorded plenty of swaggering garage material just before their chart-topping days at Abnak Records. With the full cooperation of the band, Sundazed has unearthed a Texas-sized load of fuzzy 'n primitive Americans sides that have never seen the light of day, as well as the master tapes for the band's ultra-rare Jetstar singles, circa '64-'66. 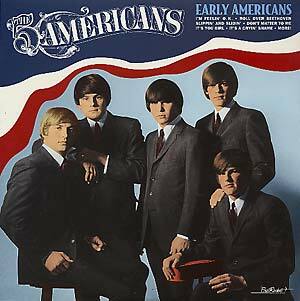 Put 'em all together and you have our new Early Americans compilation -- a powerhouse, high-definition BeatRocket LP that's guaranteed to get anyone in the vicinity dancing till dawn's early light."